LRPC is in the process of archiving its 50 year old library so that we are scanning and posting many old maps to our website. We are literally emptying our file drawers and posting this info online. 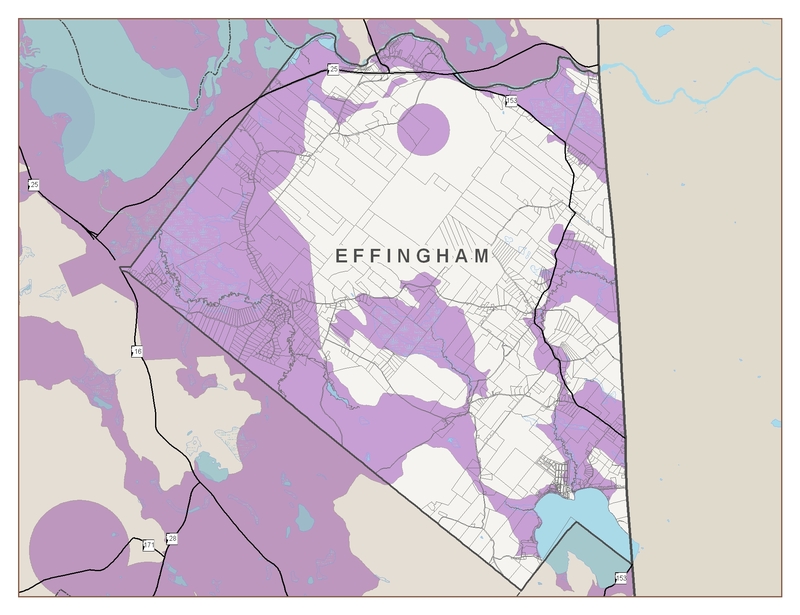 Many of these maps may get culled out and removed from the website as time goes on. If you would like to share any information on the maps that we have posted, please send your comments to admin@lakesrpc.org. Identifies and inventories any critical or sensitive areas or resources, not only those in the local community, but also those shared with abutting communities. This section provides a factual basis for any land development regulations that may be enacted to protect natural areas. A key component in preparing this section is to identify and conflicts between other elements of the master plan and natural resources, as well as conflicts with plans of abutting communities. The Natural Resources Inventory (NRI) is an environmental survey designed to help gauge natural resource status, conditions, and trends. The information contained in the NRI will be a critical component in growth management strategies while striving to balance growth and development with preserving the natural resources that define our landscapes. Fish and Game worked with partners in the conservation community to create the state's first Wildlife Action Plan. The plan, mandated and funded by the federal government through the State Wildlife Grants program, will guide efforts to restore and maintain species of concern and critical habitats -- keeping species off of rare species lists and saving millions of dollars in the process. This is a tool that has been developed for the review of Road and Stream Crossings and can be particularly useful for prioritizing mitigation and prioritization efforts. It identifies some intersections between natural resources and transportation. Beginning in the summer of 2002, the Pemigewasset River Local Advisory Committee began monitoring the quality of the water at six sites along the river. The Pemigewasset River was included in the Rivers Management & Protection Program (RMPP) under RSA 483 in 1991. Subsequently, the Pemigewawsset River Local Advisory Committee (PRLAC) was created as part of RMPP as a state chartered advisory committee responsible for developing a Management Plan for the entire river corridor. The Plan was completed in 2001 and many of its recommendations have now been implemented, including annual water quality monitoring in the river. Please visit the Official PRLAC Webpage for more information. These projects were made possible by funding from NHDES Local Source Water Protection Grants. 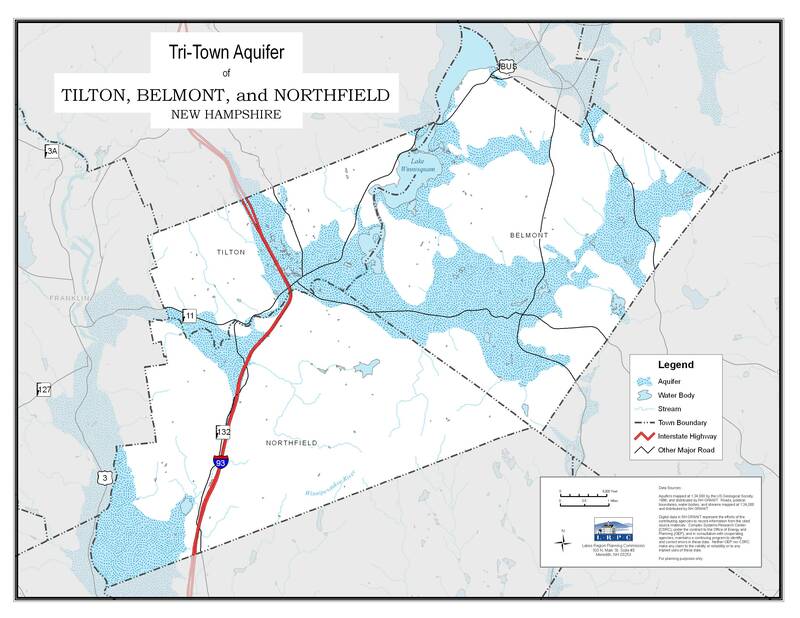 The towns of Belmont, Northfield, and Tilton have been working with the Lakes Region Planning Commission since 2001 to carry out a thorough assessment of potential threats to the stratified drift aquifer that underlies their communities, hereafter called the Tri-Town Aquifer. The collaboration developed recommendations to address potential threats and developed a report in 2003 titled Protecting Shared Drinking Water Resources: A Collaborative Initiative of Belmont, Northfield, and Tilton. This project continued through 2006 with the creation and local adoption of one of the priority recommendations - the Tri-Town Aquifer Protection Best Management Practices Guidebook. The collaborative continued in 2008 with the development of groundwater protection zoning overlays and ordinances for each town. This was the recommendation that received the highest priority in Protecting Shared Drinking Water Resources. The ordinances were based on the NHDES model groundwater ordinance and then specifically designed to address potential threats to the shared aquifer that currently serves as a source of drinking water, and which has the potential to continue to be a source of drinking water in the future. The hope is that this project will continue to foster collaboration among the three towns to protect the long-term viability of their common drinking water resources. 2003 Protecting Shared Drinking Water Resources: A Collaborative Initiative of Belmont, Northfield, and Tilton. This project is designed to address present and potential threats to water quality in the Ossipee Aquifer watershed in the Lakes Region of New Hampshire, and assist the towns of Sandwich, Tamworth, Ossipee, Effingham, Freedom, and Madison in long-term planning efforts to protect their drinking water resources. The Ossipee Source Water Protection Project was developed due to concern for the long-term quality of the drinking water supplies in the face of noticeably increasing growth projected by NH’s Office of Energy and Planning. The Green Mountain Conservation Group (GMCG), Ossipee Watershed Coalition (OWC), municipal planning boards and conservation commissions, and Lakes Region Planning Commission (LRPC) are partners in ensuring the aquifer resources are protected for current and future generations. Commercial and industrial zones are situated over a substantial portion of the aquifer along the major transportation routes. According to NH DES maps prepared in 2001, over 78 potential contamination sources (PCSs) are within well head protection areas. Upon completion of the PCS inventory by GMCG in December (2008 Source Water Protection Report), we anticipate an increase in the number of PCSs. Thoughtful planning which works to balance growth with water resource needs will assist these communities maintain the integrity of their water resources into the future. Water resources do not typically follow municipal boundaries, and for this reason the project is based on a collaborative, regional approach. The Initiative will build on the Natural Resources Planning Guide for the Ossipee Watershed published in 2007 (See www.gmcg.org) and the comprehensive inventory of PCSs completed by the GMCG in December of 2008. The inventory and outreach campaign has generated greater understanding of source water protection, GIS maps of potential risk sites and a willingness to address contamination threats at the local level. 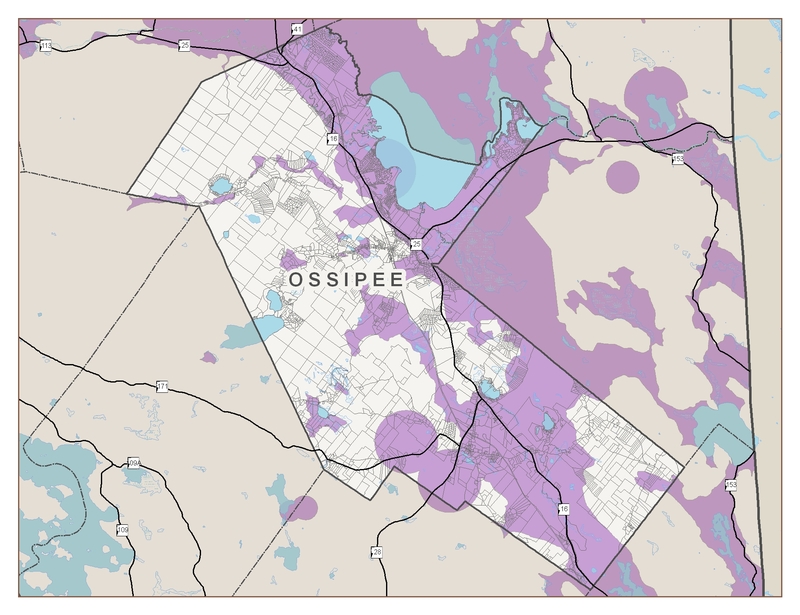 Ossipee Watershed Presentation made by an OASC member to a community organization that introduces watersheds, the risks of road salt contamination, water quality and the groundwater protection ordinance. Information about the Shoreland Water Quality Protection Act is available at the NHDES Website. The REPP was created within the Department of Environmental Services in recognition of the value of regional planning commissions in addressing environmental issues in New Hampshire. LRPC conducts environmental planning projects with member communities under the REPP and past work includes Smart Growth Audits and implementing innovative land use ordinances. To address the need for guidance and technical assistance on Innovative Land Use Controls authorized by RSA 674:21, DES and its partners, the NH Association of Regional Planning Commissions, the NH Office of Energy and Planning, and the NH Local Government Center, produced the Innovative Land Use Planning Techniques: A Handbook for Sustainable Development. This Innovative Land Use Handbook includes sections dealing with development density, environmental characteristics, and site level design. Each of the 23 chapters includes model ordinances and regulations for use by municipalities interested in implementing the innovative land use techniques. A Smart Growth Audit, or Assessment, is a process by which a community reviews the eight Smart Growth Principles, adopted by the State of New Hampshire, then explores whether the Master Plan, ordinances, and regulations support these principles. The local assessment serves as a guide, identifying links between ordinances and the Master Plan as well as pointing out areas where inconsistencies may exist. These assessments are guided by the Planning Board and town staff if available. Beginning in 2007, LRPC formed a partnership with the Audubon Society of New Hampshire (ASNH), Conservation Department, to develop a coordinated review of land use planning documents for a community. This collaboration incorporates a smart growth review by LRPC and a review of wildlife habitat and natural resources by ASNH. Past smart growth assessments were funded in part by the REPP, and more recent ones have been funded in part by the Samuel P. Pardoe Foundation.